Compare Remote Controlled Dog Training Collars: Dogwidgets or PetSafe ? 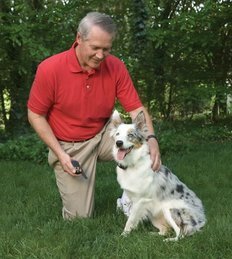 A remote controlled training collar allows the application of a small electric stimulus to your dog to discourage, control and eventually eliminate undesirable behaviors and habits. Some of these collars also generate vibrations or audible tons that can also be used alternatively to train the dog, eliminating the need for electrical stimulus, unless you are dealing with extreme cases of misbehavior. The idea behind the use of a training collar is that the dog will associate the electric stimulation, vibration or audible tone with a particular and undesired behavior and will soon learn that it can be stopped by stopping that particular behavior. These collars come with three components: a remote transmitter, a receiver on the collar, and a couple of collar probes. The way it works is that the remote transmitter sends to the receiver a radio signal that carries the stimulation information (stimulation type, intensity and duration). The receiver applies then the requested stimulation to the dog through the collar probes. Regarding electric stimulation, no dog owner wants to cause discomfort, no matter how small, to their dog. But, in certain extreme cases, where the dog's behavior is unmanageable, and no other training method works, rather than euthanizing the animal which is often the case, it makes more sense to use also some level of electric stimulation to correct the problem. In any case, most training collars provide multiple levels of electric stimulation, and in general excellent results are achieved using the lowest levels which are hardly even perceptible to humans. At the lower levels, what the dog feels resembles the slight static shock you would get from touching a metal door knob after walking across a carpeted room in your socks. As mentioned above, some remote training collars can also generate vibrations and audible tones allowing you to condition the dog to associate the vibration or audible tone with the behavior, thus eliminating the need for electrical stimulation altogether. Note also that, the outdated terms of “electric shock” or “shock collar” are incorrect to use in the context of these training collars, given that today’s collars have advanced technology to maximize safety and minimize the sensations for your dog. You will find below a comparison of the most popular two remote controlled dog training collars sold on Amazon, the Dogwidgets DW-3 and the PetSafe PDT00-12470 to help you choose the one that will best suit your needs. Note that these are not just best sellers but have also received raving reviews from Amazon customers (an average rating of 4 stars each!). Dogwidgets DW-3 training collar was the #1 best seller in training collars category at the time this review was written. . It is equipped with 6 levels of electric stimulus and 1 level of vibration and has a range of 600 feet. So this product is ideal for those who prefer also using the vibration method as an alternative to electric stimuli to train their dogs. Many Amazon customers have reported that using just the vibration mode was enough to train their dogs. Note however that the lower levels of electric stimuli are hardly perceptible to humans and will cause no pain to your dog. The collar will work with small, medium and large dogs weighing from 15 to 100 lbs with a collar size adjustable from 12 to 20 inches long. It can be used for basic training, jumping on people, chasing cars and barking. You have to press the buttons on the transmitter to initiate the electric or vibration stimuli. The transmitter and collar are water resistant but not waterproof. This means that the dog can run in heavy rain and snow with no problems, but should not swim or given a bath with the collar on. The transmitter needs a 9V battery which is included and replaceable, but the collar has a built-in battery. A wall charger and USB cord for recharging the collar battery are provided. The collar battery will last for many days between charges depending on how active the dog is: it goes into a sleep mode when the dog goes to sleep and starts working again when it detects movement. The package contains a strap, a receiver, a transmitter (battery included), a wall charger for the collar, a USB connect wire as well as one set of rubber and metal prongs. The product comes with a 6 months warranty. PetSafe PDT00-12470 training collar was the #2 best seller in training collars category at the time this review was written. . It has a range of 400 yards (1800 feet). and is equipped with 8 levels of electric stimuli and 2 audible tones alerts (a negative and a positive beep sound). So this product is ideal for those who prefer also using audible tones as an alternative to electric stimuli to train their dogs. Note that the negative audible tone is louder than the positive tone which can hardly be heard by humans, and therefore many have chose successfully the positive tone method to train their dogs with no discomfort to their pet. The collar will work with small, medium and large dogs that weigh from 8 lbs up and fits neck sizes up to 28 inches. It can be used for basic training, jumping on people, chasing cars and barking, and you have to press the buttons on the transmitter to initiate the electric or audible tone stimuli. 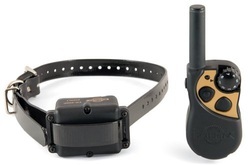 Note that the same transmitter can be used with more than one dog if extra collars are bought (up to 3 dogs can be controlled from the same transmitter). After you program the remote transmitter to the collars used, you are able to control the dogs separately, sending different training stimuli to each dog. The transmitter and collar are waterproof and have built-in, rechargeable batteries. A charger for the batteries is also provided, and it comes with a cable that has two plug ends allowing to charge the handset and collar at the same time. Note that the collar does not go into sleep mode when there is no movement, so if you need to save battery for longer periods without charging, you need to turn it off. But normally these batteries last for a long time before recharging is needed, and there is a low battery indicator that lets you know when your system needs to be recharged. The package contain collar strap and receiver, a transmitter and a charger for the built-in batteries. So which training collar to buy? 1. 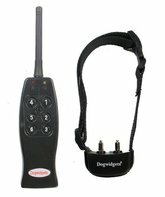 If you prefer a training collar system that supports also the vibration method of stimulus, you should go for the Dogwidgets DW-3, but if you prefer the audible tone training method as an alternative, then you should go for PetSafe PDT00-12470. Many users of these collars have reported that they did not need to use the electric stimuli at all to train their dogs, and that the vibration or audible tome methods were quite sufficient. 2. If you need to to control your dog from distances larger than 600ft, you should get the PetSafe PDT00-12470 which can manage distances up to 1800ft. 3. If you your dog weighs less than 15 lbs or more than 100 lbs, you should consider the PetSafe PDT00-12470. 4. Dogwidgets DW-3 has a more efficient battery control method in the collar which goes to sleep when there is no movement and battery is not used. So, normally it should require recharging less often. On the other hand, the battery in the transmitter of Dogwidgets DW-3 can not be recharged and needs to be replaced, while both batteries of PetSafe PDT00-12470 are built-in and rechargeable. 5. Last but not least, PetSafe PDT00-12470 is waterproof while Dogwidgets DW-3 is only water resistant. This means that, with the Dogwidgets DW-3 collar on, the dog can run in heavy rain and snow with no problems, but should not swim or given a bath. So, before you choose one or the other of these two ecellent dog training systems, you should consider well the above points so that you may choose the one that suits best your dog's needs. Note: Amazon often provides a good discount on the List Price of sold products. If a discount is available, both the List Price and the Amazon Price will be shown when you click the images below. Are you also interested in a dog GPS tracking device? Have you found yet the dog training collar you were looking for?